Thanks! How is your realm progressing? Oh ho ho…. I have about what I told you the other day 😛 I should finish reading for my friend today. Been itching to write, but 240 pages in 5 days is a hefty task for me. Been a busy 5 days too. Friday I plan on having enough of a write up to show off to you guys. Are you planning on putting more info up on your blog? I might do that too. Didn’t know how vocal we wished to be on it. Just the major races and basic landscape, but nothing more than that. Not sure why, but I always love the high collar. It gives the wearer bearing, by the way it makes them hold their heads higher. Slightly different in this case, with the open collar, but the little smug grin indicates an arrogance to the character. The chameleon-like look of the shaman is really good. Is that fur? Yeah, the reptiles are arrogant as a whole. 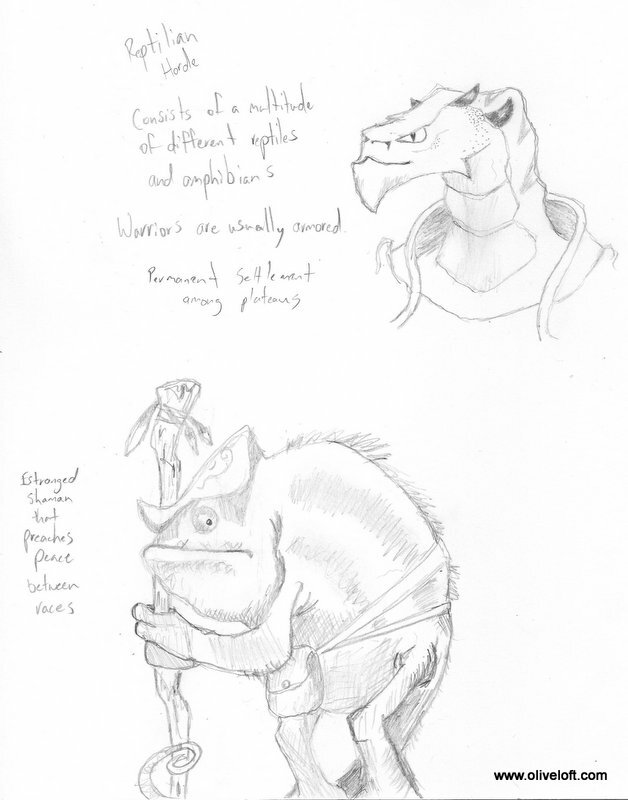 On the chameleon, i was going for more like fine spines, but that could look line fur. Never seen anything like that shaman. He’s awesome!